With more than 900 employees, including more than 776 sworn officers, the nationally-accredited Raleigh Police Department is comprised of four divisions under the direction of the Police Chief's Office, which includes the Deputy Chief and Internal Affairs. These four divisions are: Field Operations Division, Detective Division, Special Operations Division, and Administrative Services Division. 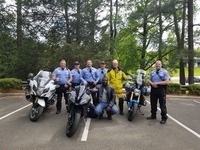 The officers, staff and volunteers with the Raleigh Police Department take very seriously their duty to provide citizens with professional, innovative and effective service. Community safety is a shared responsibility and we are committed to working in partnership with neighborhood residents and business owners as well as other local, state and federal agencies to reduce crime and increase safety.